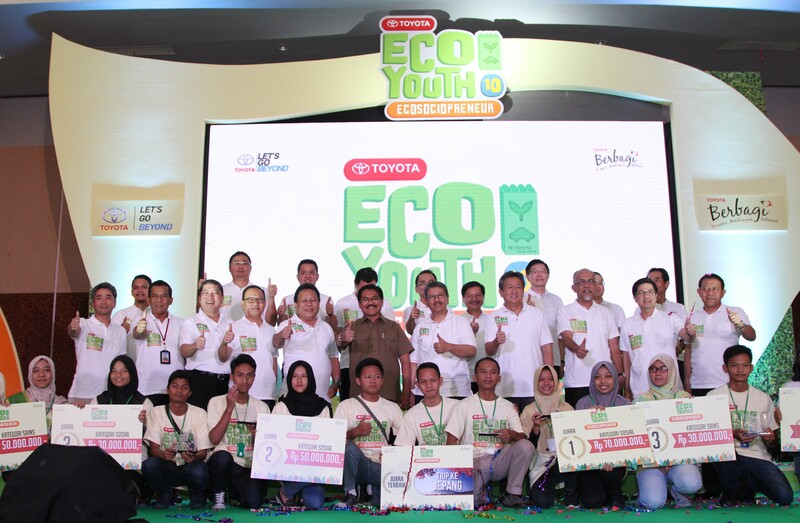 Jakarta - The enthusiasm of High School and Vocational School students on joining the environmental competition that held by Toyota Indonesia known as Toyota Eco Youth (TEY) program keep increasing year by year. On the 10th times of TEY this year, a total of 539 high school and vocational school who came from 27 provinces in Indonesia were participated. The total is above target from the implementation of the 9th TEY in 2015 which recorded as many as 438 schools. Not only from the number of schools that involved, the number of incoming project proposals this year reaching 2,534 proposals submitted from the category of science and social movements. This number increased significantly compared with the 9th TEY that reached 1,709 projects. "We highly appreciate the enthusiasm of high school and vocational school students who participated in the competition Toyota Eco Youth. This is further assured us that the students as the next generation more concerned and aware of the importance of protecting and preserving the environment to achieve future life better," says Hiroyuki Fukui , President Director of PT Toyota-Astra Motor, during the announcement of the winner of TEY 10th, in Jakarta, today. Fukui said that Toyota Indonesia will always continue to support and contribute to foster the spirit of caring for the environment among the public, especially the younger generation of Indonesia. "We congratulate to all the winners. May the action they did were able to bring positive impact and inspire friends and people in the neighborhood, "he said. Meanwhile, President Director of PT Toyota Motor Manufacturing Indonesia (TMMIN), Masahiro Nonami, on a separate occasion mentioned that in line with the spirit of Toyota Beyond Care and Toyota Berbagi, the projects that entered into the competition TEY, expected to contribute in the development of environmental conservation in a sustainable manner, that can benefit future generations. "We hope that Toyota Eco Youth program also supports education in Indonesia, especially the culture of innovative research, insights and education on the environment for the achievement of a better Indonesia in the future," said Nonami. Today, the event Awarding Ceremony TEY 10th took place at Sasana Kriya, Taman Mini Indonesia Indah, Jakarta. TEY is a environmental-based competition for high school and vocational school students that organized by Toyota Indonesia consisting of Toyota Astra Motor (TAM) and Toyota Motor Manufacturing Indonesia (TMMIN). From all the proposals that submitted, the committee has choosen 25 proposals as finalists. From all these submission, 15 proposals were covering the project of the category of Science and 10 project proposals for Social category. All 25 finalists successfully completed the realization of the environmental projects and has received votes from the jury, that consist of Toyota Indonesia management, environmentalist Dr. Jatna Supriatna, education leaders Prof. Arif Rahman, Spd, youth movement leaders Chaerany Putri, as well as media practitioners Didi Kasim. Based on the results of the jury assessment jury, selected each of the three winners for each category consisting of Science Category and Social category, as well as the other winners for the Best of The Best. For Science Category, SMK PGRI Karawang out as the 1st champion, SMAN 34 Jakarta as 2nd champion , and SMAN 1 KOBA as the 3rd champion. Meanwhile, for the Social category, SMAN 1 Blora out as the 1st champion, SMAN 19 Bandung as the 2nd champion, and MAN Model Banda Aceh as the 3rd champion. The winners in each category will be entitled to a prize of Rp 70 million for the first winner, USD 50 million for second-place winners, and Rp 30 million for the third winner. Meanwhile, the winner of the Best of the Best that is achieved by SMK PGRI Karawang will get an additional reward in the form of training on the environment in Japan. By that, the total prize money awarded to the winners in all 10th TEY program has reached IDR 600 million. By the spirit of Toyota Beyond Care and Toyota Berbagi , The 10th TEY taking the theme Ecosociopreneurship as Toyota Indonesia efforts to stimulate and keeping the values of entrepreneurship to students on the effort to save the environment. The objective is for the participants to be able to create activities that generate funds to support the sustainability of the project independently and the creation of new innovations for their environmental projects. Ecosociopreneur is a combination of ecopreneur which means entrepreneurs who care about the environment or environmental sustainability. Meanwhile, Sociopreneur is an entrepreneur who run their business is not solely thinking of personal gain, but also thinking to build and develop the community to be more empowered. Through the 10th TEY , the concept of Ecosociopreneur which was run by Toyota during this time will be transformed to high school and vocational school students as the next generation, so that the entrepreneurial spirit will be taking into the social aspects, particularly in developing environmental conservation in a sustainable and long term. For example Ecosociopreneur concept is "Insurance Trash" by "Eco-Hero" named Dr. Gamal Albinsaid. Dr. Gamal has a health clinic where patients pay with garbage. Then, the garbage is sold through the cooperative system. The money generated from the sale of waste will be used to fund operations of the health clinic. From this Independent project activities "Insurance Trash" it will be obtained the advantages where poor people can be treated at no cost, and waste can be collected for recycling. To improve the quality of the competition, Toyota Indonesia expand the scope of collaboration on TEY. If previously only involves internal school and the environment around the school, on the 10th TEY also involve the university's role as mentors and mentoring for 25 project participants who successfully became a finalist for quality improvement projects. Same thing with the implementation of TEY in the previous years, TEY 10th will consist of two (2) categories of competition, namely for the field of Science (science) and the Social Movement (social). However, in accordance with the theme Ecosociopreneurship, the scientific contested project is a sustainable project, that can run independently and contribute to the neighborhood.